While Super Cruise is engaged, an infrared camera monitors the driver's eyes, but hands don't have to be on the wheel. "What you do with your hands is up to you." Starting this fall, the Cadillac CT6 will be ready to drive itself on some Canadian roads. But it's not ready to let drivers catch up on sleep, lose themselves in a mystery novel or enjoy a four-course breakfast during the morning commute. The technology is limited to highways and other divided highways with no cross-traffic and it stays active only as long as the driver pays enough attention to keep the car happy. The system, called Super Cruise, shows how close the industry is getting to a future in which consumers can sit back and relax while their vehicle maneuvers through the tedium of traffic and the monotony of long road trips. At the same time, it's a reminder that we're still nowhere near being able to get too comfortable behind the wheel. The 2018 CT6 won't be the first semi- autonomous car on the market. But unlike Tesla, Mercedes-Benz and a few other luxury brands, Cadillac won't force drivers to touch the wheel every so often to prove they're ready to take over if the car encounters a situation it can't handle. Instead, the CT6 watches the driver's eyes through an infrared camera on the steering column. As long as the driver looks at the road ahead every seven to 20 seconds -- the faster the car is going, the shorter the minimum interval -- Super Cruise will be satisfied. It even has the ability to determine, based on head movements, where drivers are looking when their eyes are hidden behind impenetrable sunglasses. "What you do with your hands is up to you," said Barry Walkup, the chief engineer of Super Cruise. 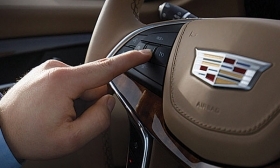 But he said Cadillac wants to help drivers manage distractions and reduce their workload, not encourage them to engage in more potentially hazardous activities behind the wheel. Super Cruise gives drivers the freedom to have conversations, eat a sandwich or enjoy the scenery without fear of rear-ending another vehicle. But turn away from the road for too long, and it starts to worry. At that point, the car uses a series of escalating alerts over the course of about 45 seconds to a minute, again depending on speed. A light bar on the steering wheel flashes -- first green, then red. If the driver looks back at the road, the system calms down; if not, the seat vibrates or a warning chime sounds, depending on the owner's preference. Next comes a spoken message urging the driver to take control of the vehicle. If all those attempts fail, the car activates its hazard lights, slows itself to a stop in the lane that it's in and initiates a call with OnStar to see if the driver needs first responders to come treat a medical condition. In the United States, Super Cruise will be a US $2,500 option available on either the US $65,000 CT6 Premium Luxury or the top-of-the-line US $85,000 CT6 Platinum. Cadillac Canada hasn't revealed pricing, yet. Mike Ramsey, a transportation and mobility analyst with Gartner Inc., said Cadillac's approach may be less risky than the technology deployed by Tesla and other rivals, but whether people will find it practical remains to be seen. "There is a market for sure, probably at quite an upcharge, for a system that will drive you on the highway, in traffic," Ramsey said. "But if you lock down on it so much that it kind of limits the freedom you have, it really limits that market." Walkup said he doesn't think buyers will find the system too restrictive. "We want to offer our customers different levels of convenience," he said in an interview at the New York auto show. "Our data supports that it's safer and that the customer wants it." Super Cruise also differs from rivals' systems in that it uses lidar-scanned maps to increase precision, though the car itself doesn't use lidar, a still-costly technology that's used on most fully autonomous vehicles being tested by General Motors and other automakers. GM called on GeoDigital, a company it has invested in, to map out all 257,000 kilometres of limited-access highways in Canada and the United States. GM then tested Super Cruise on every kilometre of mapped highway to ensure the technology was fully ready for the public. The maps give Super Cruise advance knowledge of situations in which the driver needs to take control, such as the end of a freeway or a tollbooth. Such a comprehensive level of validation is one reason why GM delayed rolling out Super Cruise by about a year. It had previously said the feature would be part of the 2017 CT6.